HID conversion kits or headlight bulb replacements for your Chevrolet Silverado can be one of the most dramatic improvements to nighttime driving safety that you can do to your truck. These new headlights, HID or High Intensity Discharge, are designed to improve the down road, roadside and inclement weather safety and visibility for your 2007, 2008, 2009, 2010 or 2011 Chevy Silverado. As a rule, we typically suggest the 4300 Kelvin HID for the brightest light possible but the 5000K is also a very impressive light when speaking about eliminating the road ahead. The 6000K and the 8000K both give off a blue tint that many find appealing. Both of the latter are definitely an upgrade from the stock headlights but the blue just doesn't seem to illuminate the road as well as the white does. The 6000K gives off an ice blue color to the light while the 8000K is a definite blue color. I used the 6000K HID’s from Ultra Bright Lights in the 6 inch driving lights on our motorhome and like the visibility offered by them very well. I have the 5000K HID conversion in the headlights and just can’t tell you the difference without sounding arrogant. So far, I have not driven with a set of 4300K HIDS after dark so I can’t relate to you a true hands on experience as to how these lights work. 10,000K and 12,000K HIDS put off a purple hew to the light with the 12,000K being very purple in color. Typically, the 8000K, 10,000K and 12,000K HIDS are purchased for looks and not as an upgrade in the lighting system of the truck. Remember that the higher the number doesn't translate to a brighter headlight. Installing the 5000K HID conversion into our 2011 Chevy Silverado. 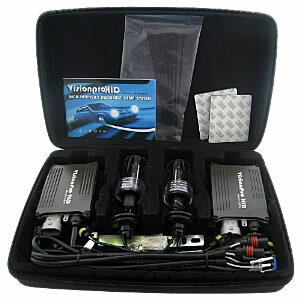 Follow along as we install a set of Vision Pro HID's from Ultra Bright Lights. See Installing HID Headlights for the 2011 Chevy Silverado 1500 The Chevy HID Headlight kits include HID Xenon bulbs, next generation digital ballasts and a complete, Top Quality, wiring harnesses that will literally plug directly into the stock Chevy Silverado headlight harness connectors making installation a snap.